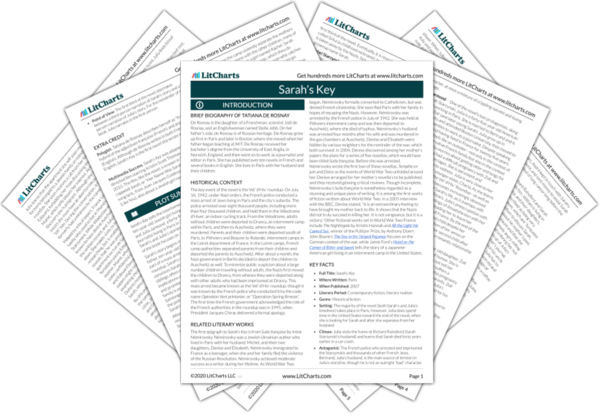 Instant downloads of all 946 LitChart PDFs (including Sarah’s Key). 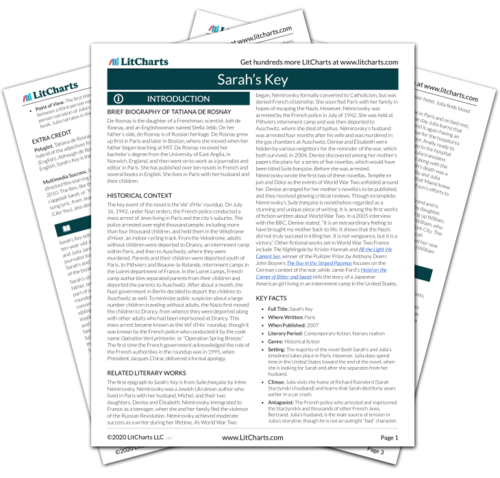 Welcome to the LitCharts study guide on Tatiana De Rosnay's Sarah’s Key. Created by the original team behind SparkNotes, LitCharts are the world's best literature guides. A concise biography of Tatiana De Rosnay plus historical and literary context for Sarah’s Key. A quick-reference summary: Sarah’s Key on a single page. In-depth summary and analysis of every chapter of Sarah’s Key. Visual theme-tracking, too. Explanations, analysis, and visualizations of Sarah’s Key's themes. Sarah’s Key's important quotes, sortable by theme, character, or chapter. Description, analysis, and timelines for Sarah’s Key's characters. Explanations of Sarah’s Key's symbols, and tracking of where they appear. An interactive data visualization of Sarah’s Key's plot and themes. De Rosnay is the daughter of a Frenchman, scientist Joël de Rosnay, and an Englishwoman named Stella Jebb. On her father’s side, de Rosnay is of Russian heritage. De Rosnay grew up first in Paris and later in Boston, where she moved when her father began teaching at MIT. De Rosnay received her bachelor’s degree from the University of East Anglia, in Norwich, England, and then went on to work as a journalist and editor in Paris. She has published over ten novels in French and several books in English. She lives in Paris with her husband and their children. 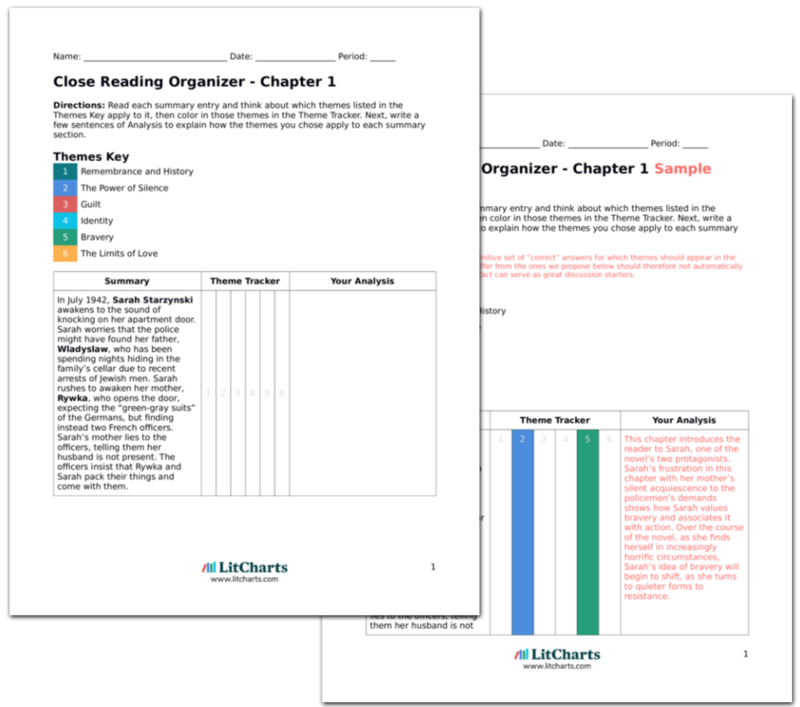 Get the entire Sarah’s Key LitChart as a printable PDF. The key event of the novel is the Vel’ d’Hiv’ roundup. On July 16, 1942, under Nazi orders, the French police conducted a mass arrest of Jews living in Paris and the city’s suburbs. The police arrested over eight thousand people, including more than four thousand children, and held them in the Vélodrome d’Hiver, an indoor cycling track. From the Velodrome, adults without children were deported to Drancy, an internment camp within Paris, and then to Auschwitz, where they were murdered. Parents and their children were deported south of Paris, to Pithviers and Beaune-la-Rolande, internment camps in the Loiret department of France. In the Loiret camps, French camp authorities separated parents from their children and deported the parents to Auschwitz. After about a month, the Nazi government in Berlin decided to deport the children to Auschwitz as well. To minimize public suspicion about a large number children traveling without adults, the Nazis first moved the children to Drancy, from whence they were deported along with other adults who had been imprisoned at Drancy. This mass arrest became known as the Vel’ d’Hiv’ roundup, though it was known by the French police who conducted it by the code name Opération Vent printanier, or “Operation Spring Breeze.” The first time the French government acknowledged the role of the French authorities in the roundup was in 1995, when President Jacques Chirac delivered a formal apology. The first epigraph to Sarah’s Key is from Suite française by Irène Némirovsky. Némirovsky was a Jewish Ukrainian author who lived in Paris with her husband, Michel, and their two daughters, Denise and Élisabeth. Némirovsky immigrated to France as a teenager, when she and her family fled the violence of the Russian Revolution. Némirovsky achieved moderate success as a writer during her lifetime. As World War Two began, Némirovsky formally converted to Catholicism, but was denied French citizenship. She soon fled Paris with her family in hopes of escaping the Nazis. However, Némirovsky was arrested by the French police in July of 1942. She was held at Pithviers internment camp and was then deported to Auschwitz, where she died of typhus. Némirovsky’s husband was arrested four months after his wife and was murdered in the gas chambers at Auschwitz. Denise and Élisabeth were hidden by various neighbors for the reminder of the war, which both survived. In 2004, Denise discovered among her mother’s papers the plans for a series of five novellas, which would have been titled Suite française. Before she was arrested, Némirovsky wrote the first two of these novellas, Tempête en juin and Dolce as the events of World War Two unfolded around her. Denise arranged for her mother’s novella’s to be published, and they received glowing critical reviews. Though incomplete, Némirovsky’s Suite française is nonetheless regarded as a stunning and unique piece of writing. It is among the first works of fiction written about World War Two. In a 2005 interview with the BBC, Denise stated, “It is an extraordinary feeling to have brought my mother back to life. It shows that the Nazis did not truly succeed in killing her. It is not vengeance, but it is a victory.” Other fictional works set in World War Two France include The Nightingale by Kristin Hannah and All the Light We Cannot See, winner of the Pulitzer Prize, by Anthony Doerr. John Boyne’s The Boy in the Striped Pajamas focuses on the German context of the war, while Jamie Ford’s Hotel on the Corner of Bitter and Sweet tells the story of a Japanese-American girl living in an internment camp in the United States. Setting: The majority of the novel (both Sarah’s and Julia’s timelines) takes place in Paris. However, Julia does spend time in the United States toward the end of the novel, when she is looking for Sarah and after she separates from her husband. Climax: Julia visits the home of Richard Rainsferd (Sarah Starzynski’s husband) and learns that Sarah died forty years earlier in a car crash. Antagonist: The French police who arrested and imprisoned the Starzynskis and thousands of other French Jews. Bertrand, Julia’s husband, is the main source of tension in Julia’s storyline, though he is not an outright “bad” character. Point of View: The first third of the novel alternates between a third-person narration of Sarah’s story and a first-person narration of Julia’s story. For the remainder of the book, Julia narrates in the first-person. Polyglot. Tatiana de Rosnay describes herself as “franglaise,” a hybrid of the adjectives française (French) and anglaise (English). Although de Rosnay writes in both French and English, Sarah’s Key is the first novel she wrote in English. Multimedia Success. Sarah’s Key was adapted into a French-directed film starring Kristin Scott Thomas as Julia Jarmond in 2010. The film, like the novel, is known in French as Elle s’appelait Sarah, or “Her Name Was Sarah.” This title is itself a song lyric, from Jean-Jacques Goldman’s 1982 song Comme toi (Like You), also about a Jewish girl named Sarah. Grimm, Alexandra. "Sarah’s Key." LitCharts. LitCharts LLC, 16 Jan 2018. Web. 24 Apr 2019. Grimm, Alexandra. "Sarah’s Key." LitCharts LLC, January 16, 2018. Retrieved April 24, 2019. https://www.litcharts.com/lit/sarah-s-key.